FIREWORKS MAGAZINE #77 on sale now! Thursday December 15th sees the street date for the new mega issue of Fireworks Magazine. 132 pages crammed full of all the best music from across the melodic rock spectrum. 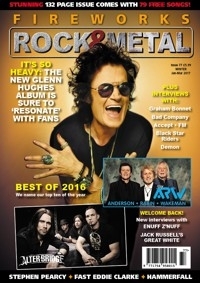 For lovers of Classic Rock we have interviews with Glenn Hughes, Demon, Graham Bonnet, Bad Company, Black Star Riders, Stephen Pearcy and a surprisingly candid Jack Russell on all things Great White. On the heavier side of things we talk to Accept, HammerFall, Pretty Maids, Enbound and Kai Hansen while over on the more AOR/MHR fringes we catch up with FM, Mecca, From The Fire, Seven, White Widdow, Cornerstone and many more! On a more historical note we have a very open and honest discussion with Fast Eddie Clark on his departure from Motörhead and subsequent formation of Fastway, catch up with ex Tygers of Pan Tang vocalist Jon Deverill and talk to the guys from that wonderful US band New England on their new live album and likelihood of new music. Add to this all your favourite new regular features such as The Bands That Time Forgot, The Vinyl Countdown, Sisters In Rock, Breaking Bands, Unsung Heroes, The Experts Guide as well as a one-off look at ways of getting your music books published and our writers' Best of 2016 lists, and not forgetting your free CD with over 70 mp3 songs and additional pdf — so can see how much Value For Money we love to give our readers. Interviews, reviews and 79 FREE songs: LET'S ROCK! NOW AVAILABLE AT OVER 1000 PARTICIPATING WH SMITH, McCOLLS AND MARTINS SHOPS AS WELL AS IN THE USA AND CANADA! Purchase direct from Rocktopia in the Fireworks Magazine Mini Shop. Subscriptions available there also. Copies/subscriptions can be ordered direct by emailing [email protected], paying via Paypal. Send £7 (Inc P&P) for UK, £9.95 (inc P&P) for Europe, and £11.95 (inc P&P) for USA/Rest of World. YOUR COPY DIDN'T COME WITH THE FREE CD? PLEASE FOLLOW THIS LINK FOR DOWNLOAD INSTRUCTIONS!